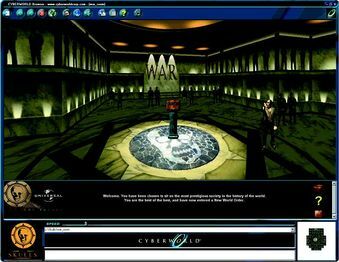 Cyberworld QBORGs are 3D "web pages" that utilized multimedia in a simple, grid-based 3D environment. The QBORG technology was developed by Cyberworld International Corporation in 1999. Their clients included Warner Bros., Universal Pictures, Stan Lee Media, ATI Technologies and Discovery Channel Canada. QBORGs are 3D levels that can only be properly accessed through Cyberworld's proprietary browser. Levels are stored in an XML format that map the world in a 16x16 grid, and contain references to textures for ceilings, walls, floors, and sprites, as well as an "emblem" and a minimap graphic. Despite having unusual file extensions, these graphics are simply PNG or JPEG files. Sprites are also PNGs or JPEGs, though with extra metadata that dictate their behavior in-game. The company's website suddenly disappeared in 2003, though some QBORG projects hosted elsewhere were seen as late as 2015. None have been fully found, especially since their unusual format made automated archiving difficult. The Cyberworld browser browser does not play well with the missing content. When it comes to missing sprites, if a level is loaded offline, the browser will not load any remaining sprites, whether they will work or not. If the level is loaded from a website, the level will not load at all. In the former case, this can be remedied by placing empty files with the proper filenames in the "objects" folder. Earlier versions of the browser, such as the version "bundled" with Pokémon 2000 Adventure, can tolerate missing floor or background textures for levels loaded from the local disk, though later versions of the Cyberworld Browser are less forgiving. One quirk in regards to the Cyberworld Browser as opposed to other browsers is that QBORG content is downloaded to the installation folder rather than simply being in browser cache. This opens up the possibility of finding lost QBORG content on old hard drives. The Pokémon 2000 Adventure Game was developed in collaboration with Warner Bros. to promote Pokémon: The Movie 2000. The player is tasked with traveling to three islands to retrieve three Ancient Spheres by solving trivia questions. Based on the DCAU cartoon The Zeta Project, Zeta Quest 3D put the player in the role of the robot Zeta as he seeks out his creator, Dr. Selig with guidance from Rosalie "Ro" Rowan. The player faces obstacles such as finding key items or choosing the right disguise to get past security cameras. Based on the 2000 Universal thriller The Skulls, The Skulls: Initiation took the player through an "initiation sequence" featured in the film. 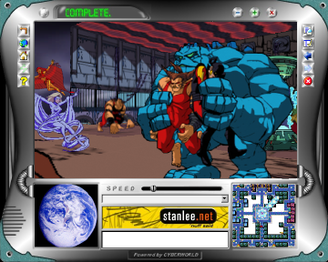 Produced by Stan Lee Media, Scuzzle Station X showcased the comic co-creator's "new line of branded superheroes". Not much else is known about this project. Boneville 3D featured locations and characters from Jeff Smith's comic, Bone. All that has been found of this one is the front page. 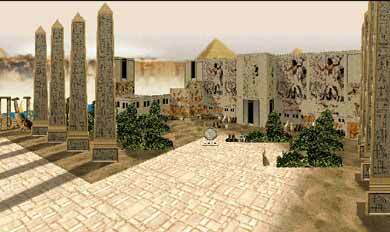 Ancient Egypt from Discovery Channel Canada, showcased, as the name implied, parts of ancient Egypt. 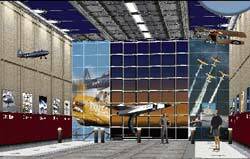 Another Discovery Channel Canada project, 3D Hangar was a recreation of a hangar and showcased aircraft from the Canada Aviation Museum.